Mid-Summer is wildfire season up here (as it is in most of the West). 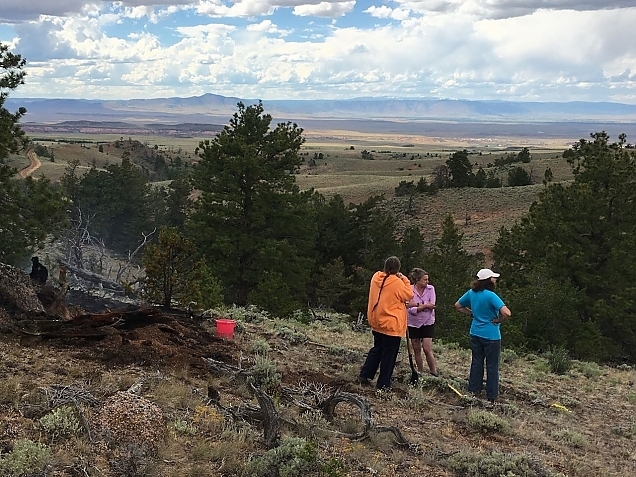 A small forest fire, called the Keystone Fire, has been burning near Albany, WY--about 30 miles away--for the past month. We occasionally get some smoke from that fire, but it has not spread much and is about 50% contained. First signs of the "Pole Cat" fire. 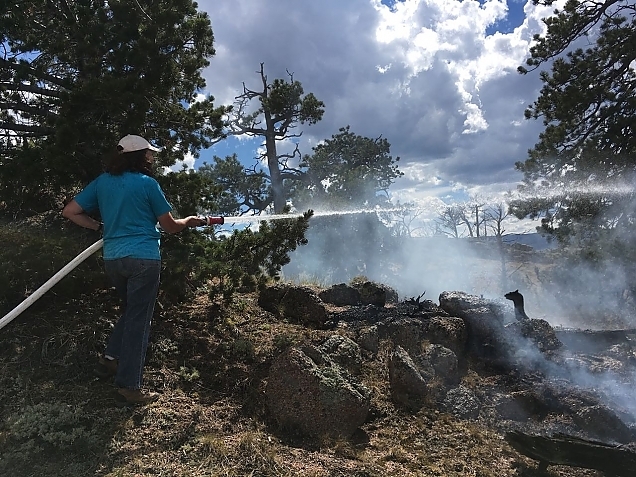 It has been hot and dry with no measurable rain for a while, so the conditions for a wildfire are optimal. And, with idiots firing off fireworks for the 4th of July (you know who you are), campers with open fires in the woods, and occasional dry lightning, the opportunity for ignition are high. Lynne and I had been in town yesterday morning doing some shopping to get us through another week. After we got home, about 1:40 in the afternoon, I got a call from our "neighbor" David. (I put "neighbor" in quotes because we all live on large parcels of land and our nearest neighbor is still quite a long way away). He told me that Bruce from the Chimney Rock Ranch had called to say he saw smoke rising out of a draw in Sand Creek Park somewhere east and to the south of the Running Water Ranch. David was going to drive toward the Running Water Ranch using Bridge Road. 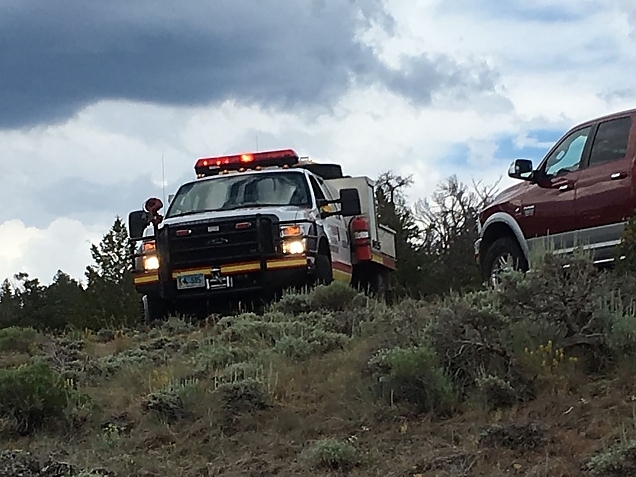 He wondered if we'd jump in our truck and go around another way, up CR80C to FR87C and then back into Sand Creek Park from the east, watching for smoke and thus the location of a possible fire. Lynne, Destin and I jumped in the truck and took off. When we got to the boundary of Sand Creek Park on Running Water Ranch Road, we could smell, but not see, smoke. 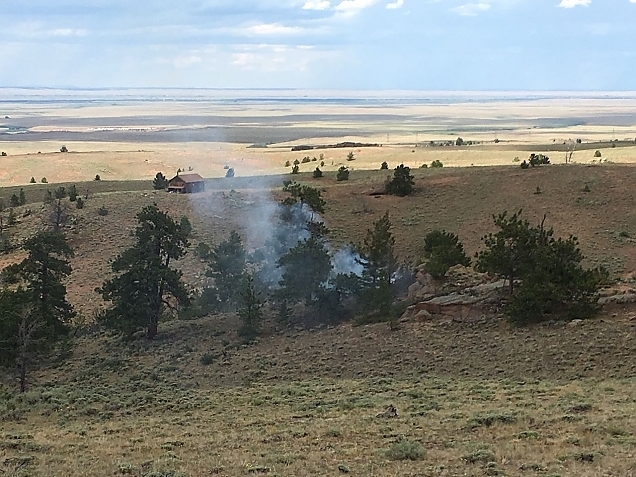 When we finally got to the ranch location (it is no longer a working ranch but a seasonal residence of the restored ranch buildings), we turned around and could see smoke coming up from a draw directly to the east of us. Sure enough, there was a small wildfire somewhere over there. It was now 2:28 and I called 911. 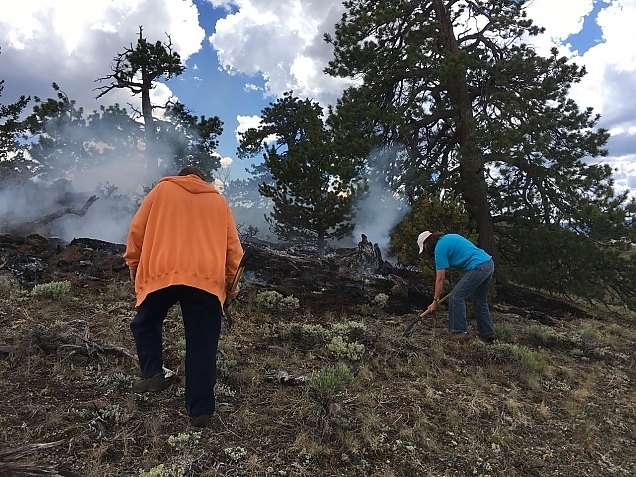 I got an operator in Wyoming and once we established that the fire was probably in Colorado, they transferred me to the Larimer County Sheriff's Office where I described the situation and the approximate location of the fire. They said they'd dispatch appropriate resources. David and Debra had joined us at the Running Water Ranch, and they took off up Laramie Overlook road while Lynne and I backtracked to FR87C, also known as Boulder Ridge Road, where we drove north for a while and then came back into Sand Creek Park on Laramie Overlook road from the opposite direction. And, sure enough, at one point we could see the smoke and even flames at the base of the smoke. I called David to report, but he and a few others were already on the scene. He gave me exact directions to the fire. I called 911 again and was routed to the Sheriff's Office where I described the exact location of the fire--turn off Laramie Overlook onto Pole Cat and climb the hill. Park where there were other vehicles and hike down the hill some. The first photo above is the scene from where our trucks were parked. 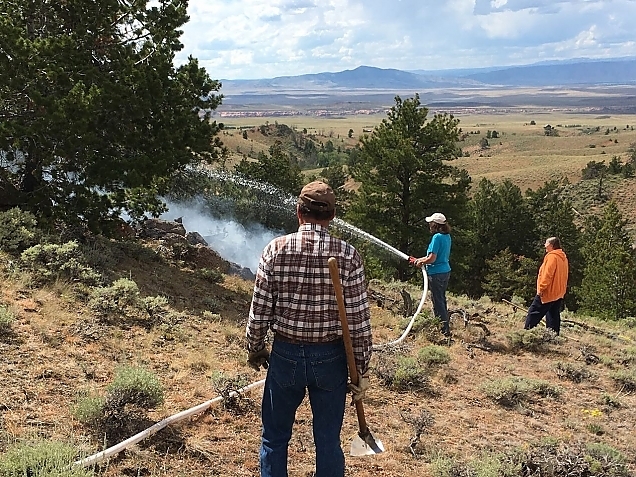 When I got to the fire, there were several people already there: Bruce, the rancher who originally spotted the smoke had driven toward it, then hiked in with a shovel. Melissa, who has a cabin nearby and was alerted to the fire by David and Debra. She had some shovels and an axe that she brought to the fire. And, David and Debra were there. 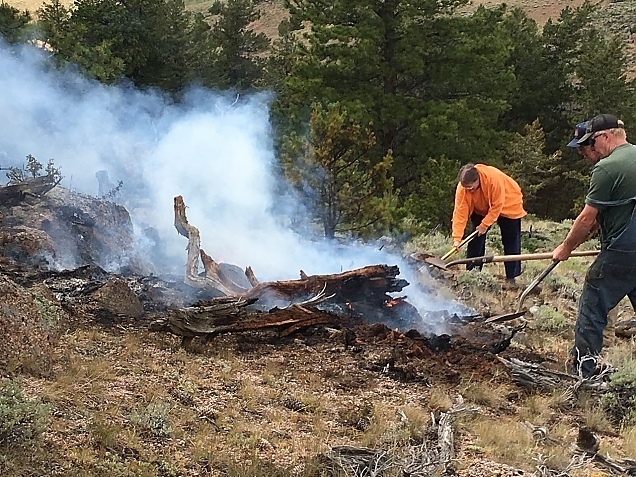 All were already working the perimeter of the fire with shovels to keep it contained. The beginnings of a wildfire. I was surprised at how hot the fire was. There were large stumps of dead Ponderosa pine that were slowly burning. They gave off tremendous heat. And, the fire was at the core of these large stumps. So, it appears the fire had been burning for quite a while. Lightning had clearly hit the large pine that you can see at the right side of the above photo. You could see the "zipper" line where the lightning had wrapped around the tree and hit the ground. 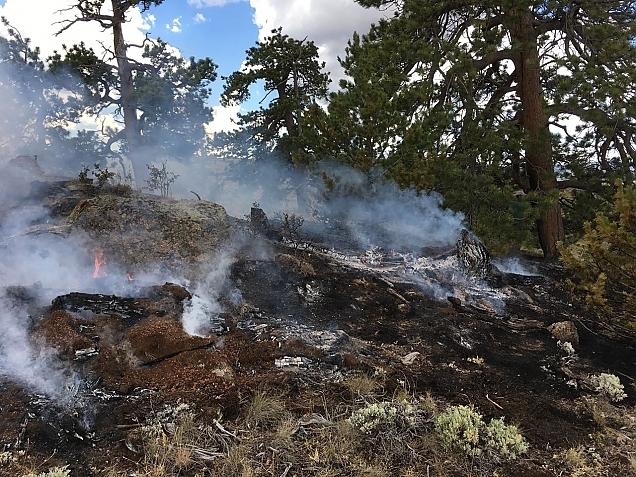 Likely, that started the dry pine needles at the base of the tree on fire and it spread to the dead stumps and surrounding grasses. 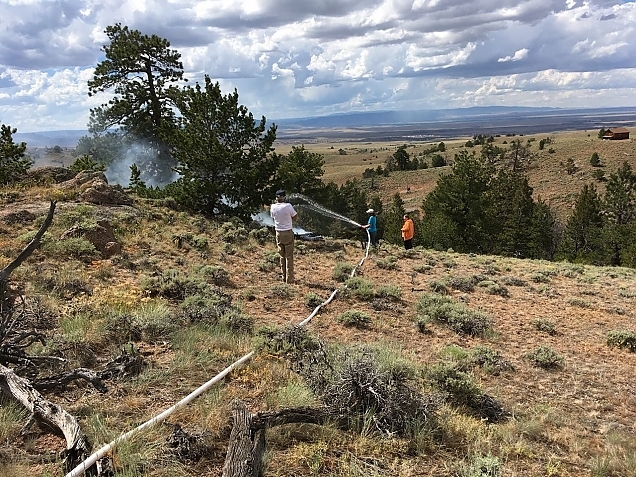 Luckily, the ground was damp and there was no wind, so the fire stayed contained to a relatively small area (although it kept trying to escape while we were there). The "girls" keeping the fire contained. 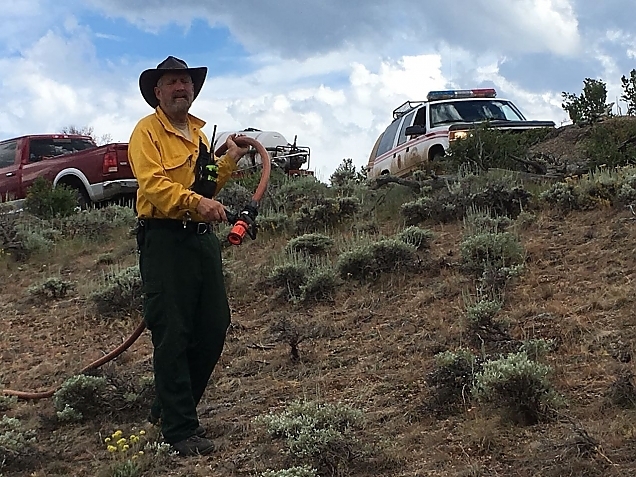 Oscar, another "neighbor" from way over on Bull Mountain drove toward the fire and on the way picked up one of our fire wagons. We have three stationed around Sand Creek Park. 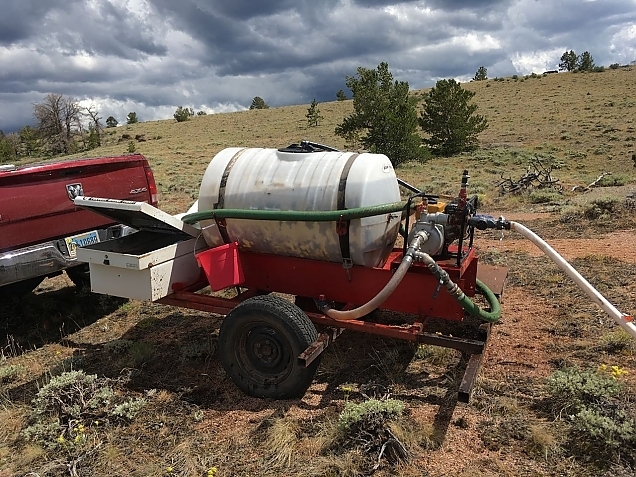 They are trailers with several hundred gallons of water onboard as well as a gas powered pump, a couple of strings of hose, some tools like shovels and rakes, as well as a way to pump more water into the tank if needed. Oscar showed up with the fire wagon at 3:26 and we got right to work. We need to do some maintenance of these wagons, I guess. We could not immediately get the storage compartment that held the hose open. And, a valve to turn on the water was stuck. But, with some brute force we got those fixed. The engine started right up and soon we had water flowing to the fire. One string of hose was enough that along with the water pressure, Debra was able to douse most of the active area of the fire. David looks on as his wife takes charge of the water. The scenery is beautiful, but the idea of a wild fire is scary. I'm not sure how much water the fire wagon holds, maybe a couple of hundred gallons? It did not take long to exhaust the amount of water on board. But, the water did put down the flames and allowed us to work and turn the ground with shovels to further suppress the fire. No that is not a sea monster, but a burned stump. By about 3:50, we'd done what we could with water. And, the active fire was suppressed. But, the scene was till smoldering and the stumps were still hot with coals. 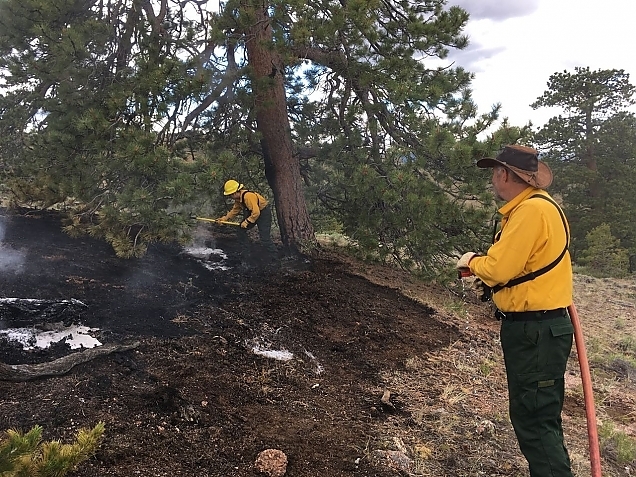 The fire was not "out" yet by any means, but it was also unlikely to go anywhere as long as we kept working the perimeter with shovels and rakes. No more flames, and well under control by about 3:45. Good thing, too. We were out of water. At 3:53, the first responder arrived. A volunteer from the Livermore (Colorado) fire department arrived in a truck. He had come up CR80C to FR87C to Laramie Overlook then into Sand Creek Park where he could see the fire. He whooped his siren to let us know he was close by. He still had to find Pole Cat and get up the hill to us. As he drove in, at each turn that got closer to the fire he'd drop some flags out the window of his truck. These flags would then be indicators to those that followed where to turn to locate the fire. He called in over an open frequency monitored by all the fire departments in the area as well as the Sheriff's office. He gave the exact location of the fire along with the status. The "locals" had established a perimeter and had the fire in control. This first responder did not carry any water, but was able to get to the scene fast, do an assessment, and rally any additional help needed. But, before the Livermore FD could get to the site with a water truck, the Tie Siding (Wyoming) volunteer fire department showed up. They had come up Boulder Ridge Road (FR87C) from the Wyoming side and the followed the flags to the site. They had a crew of two. And water! The Tie Siding Volunteer Fire Crew shows up at 3:53. Just less than 1-1/2 hours after the first 911 call. Here comes more water. And, foam is mixed with the water to halve its viscosity. That effectively doubles the amount of water while helping to lower evaporation and further suppress the fire. The crew of two, a man and a woman, began further dousing the fire with water and foam. All the while, the woman was using a shovel to turn the dirt and ash over. They were working the moisure into the ground. It started to get cloudy, and we could hear the rumble of thunder in the background. 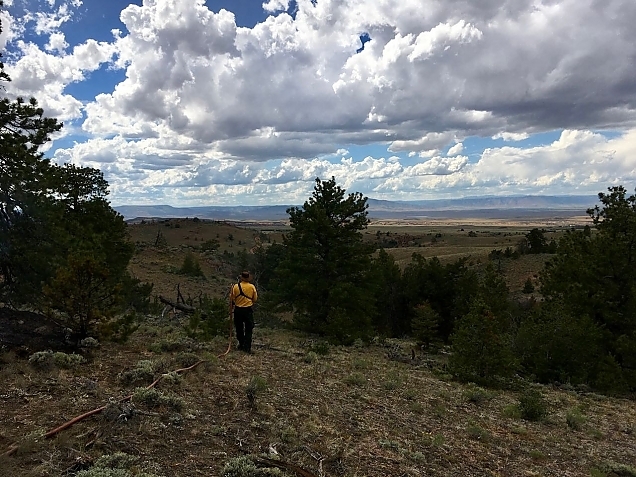 What a beautiful view into Wyoming from the fire site. The fire likely started when lightning hit the tree in the background. Since the tree is alive and "wet" it did not catch. But, the dry pine needles and pine cones at its base did. They must have smoldered overnight. The Livermore FD water truck had arrived in the area about the same time that the Tie Siding crew showed up. But, rather than climb the hill on Pole Cat, they stayed on the other side of the canyon. If more water was needed, they could provide it. So, both fire departments played a role. 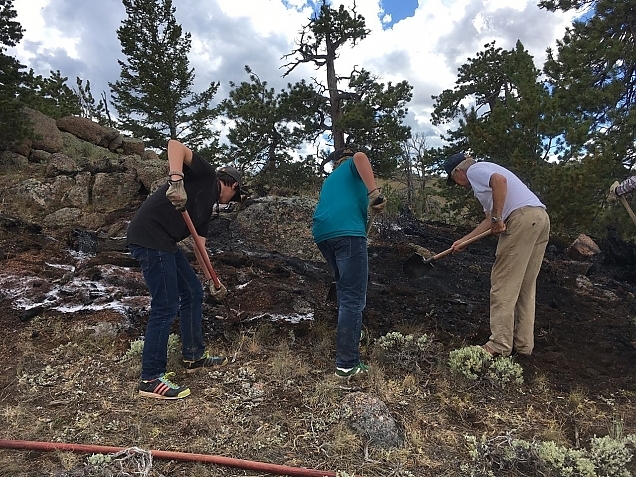 Also, around 4:00 another "neighbor", Ron, showed up with a second fire wagon and some young stong nephews who could help turn the soil and finally suppress the fire. Strong, young backs, (well maybe not the dude in white), turn the soil and further suppress the fire. At this point, about 4:15, Lynne and I left. There was nothing more we could do on the site and poor Destin had been sitting in the truck for a couple of hours. He was ready to get home to a big drink of water and his dinner.